Tennessee Titans-Themed Home For Sale: Nashville's Ultimate 'Fan Cave'? The NFL season may be limited to just 16 games -- give or take a few, if your team is lucky enough to grace the postseason –- but one home venue invites you to enjoy the football stadium experience year-round. Whether you are in the market for the ultimate Tennessee Titans tailgate or are simply a die-hard NFL fan, you have to check out this incredible townhouse in Nashville. Listed for $1.25 million, the rustic home is found in Nashville's arts district and certainly shows an artisan's touch. Meticulously renovated in 2009, the 4,428-square-foot townhome shows beautiful exposed brickwork, granite and hardwood flooring. A cathedral-style living room features ornate coffered ceilings. And a chef's kitchen sports stainless steel appliances and custom finishes. Despite these fancy features, the real appeal is the upstairs loft. With a wet bar, a Titans-themed pool table and a ton of other team swag decorating the walls, the upstairs is an all-pro man-cave "fan cave." 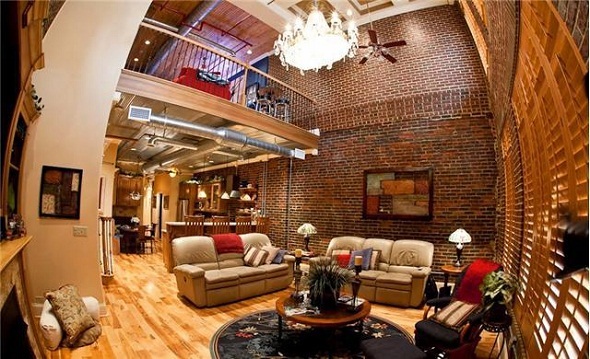 However, it's the garage door that opens to a rooftop patio and Jacuzzi overlooking LP Field that clearly separates this loft from its opponents. This is a home for someone who bleeds red, white and Titans blue. A chef's kitchen sports stainless steel appliances and custom finishes. A cathedral-style living room features ornate coffered ceilings. Meticulously renovated in 2009, the 4,428-square-foot townhome shows beautiful exposed brickwork, granite and hardwood flooring. The real appeal is the upstairs loft. There's a wet bar, a Titans-themed pool table and team swag decorating the walls. The garage door opens to a rooftop patio and Jacuzzi overlooking LP Field.